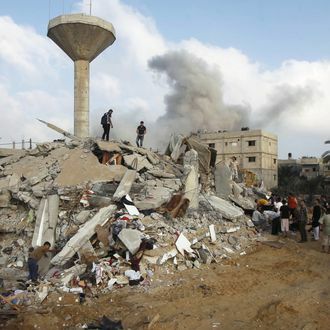 With the planned 72-hour humanitarian cease-fire thoroughly shattered, the Israeli military continues to bombard Gaza with shelling and air strikes while Palestinian militants launch rockets into Israel. Israel’s attacks have been especially intense in the town of Rafah, where 23-year-old Second Lieutenant Hadar Goldin went missing during a Friday firefight. (Reuters reports that 150 Palestinians have been killed in Rafah since Friday.) On Saturday, Israeli military spokesman Lieutenant Colonel Peter Lerner said that troops have “increased [their] activities” in the area as part of the effort to find Goldin, who is believed to have been kidnapped. However, Hamas has said that the Israeli officer is not in their custody, and that he might be dead. Hamas also repeated the claim that its fighters attacked Goldin’s unit before the cease-fire’s scheduled start. Meanwhile, Reuters reports that Israel does not plan to send representatives to Cairo for another round of truce talks with Palestinian envoys. “They (Hamas) cannot be trusted to keep their word. They cannot stop (firing) because, for them, a ceasefire at this stage, whether by arrangement or not by arrangement, would mean acknowledging the worst possible defeat,” said Deputy Foreign Minister Tzachi Hanegbi, suggesting that Israel plans to end the now 25-day-old war on its own terms.